Queen Anne’s Lace has long been known as an herbal remedy and natural dye source. The shades can range from yellows to greens. In this first experiment we got a very pale shade because the concentration of plant material was quite low. Gather a larger amount of flower heads for a more intense color. Step 1: Prepare the yarn. Mordant the wool with alum. I use a 10% by weight-of-goods proportion of alum to wool. Botanical Colors has a great tutorial on mordanting with alum. Step 2: Gather the Queen Anne’s Lace. Here in Vermont, Queen Anne’s Lace peaks in late July. You want to harvest the flower clusters when they are fresh. For a very pale shade like our yarn, use 1 – 2 cups of flowers per 100 grams of yarn. For a more intense color you’ll want to use 5 – 10 times this amount. Step 3: Extract the dye and wet the yarn. Place the Queen Anne’s Lace in your dye kettle and top up with warm water, then add heat and bring to a gentle simmer (180 – 190 F). Stir occasionally and cook for about 30 minutes. 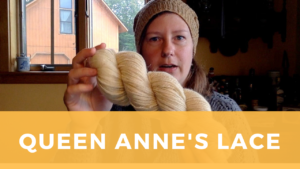 While the color is extracting, wet your yarn out in hot water in a covered container (like a bucket or extra pot with a lid) to retain the heat. When the color of the dye is looking saturated, strain off the liquid into another pot or bucket. I use a mesh paint strainer for this purpose to catch all the fine plant material. Step 4: Dye the fiber. Pour the dye liquid into your dye kettle and place back on the heat source. Gently lift your yarn or fiber out of the soaking container and place into the dye kettle. Give it a gentle stir and poke to submerge. Simmer the yarn in the dye bath for at least an hour, giving it a gentle swish every once in a while (too much agitation can felt the yarn so stirring should be infrequent). After an hour, turn off the heat and cover the pot. I like to leave my dye kettles overnight to cool slowly. Step 5: Rinse and dry. 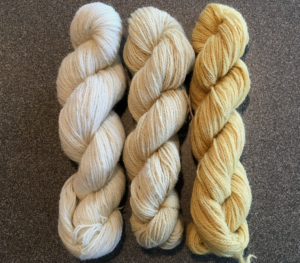 L to R: Undyed yarn, Queen Anne’s Lace dye, Lichen dye. Gently lift the fiber out of the dye kettle and allow the excess dye liquor to drain back into the pot. Then transfer to a bucket of clean water and let soak for a couple of minutes. If necessary, lift the fiber out of the rinse bucket and place into a third bucket or pot of clean water, to rinse a second time. I’ve found Queen Anne’s Lace doesn’t need much rinsing. In a shady spot, hang the wet yarn up to dry or drape over the back of a lawn chair and allow to dry. You might want to bring the yarn inside after it stops dripping, as humidity in the air can keep it from drying completely outside. 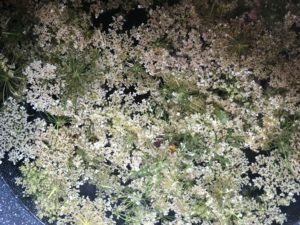 Have you tried dying with Queen Anne’s Lace? Leave a comment here or on the accompanying video and let us know how it turned out.